It seems like most parents really value the idea of having their kids volunteer. I don't need to tell you how volunteering can teach kids gratitude and compassion. You already know it can help connect them to their communities and instill a sense of pride. But what you may not know is how to volunteer with kids. Where to start? How to fit it in your busy schedule? What can the smaller kids possibly do? Now these are things I can help you with. Let’s start with time constraints. Volunteering doesn’t have to be done on a weekly or even monthly basis. It can be done at holidays, over school breaks or whenever the need arises. Have a little artist at home? Or have a kid that brings home too many art projects to save? Find a spot to collect artwork and then send it to Color A Smile (http://www.colorasmile.org/), an organization that distributes children’s artwork to nursing homes, hospitals and Meals on Wheels. Speaking of Meals on Wheels, if you have one near you stop by and ask for some brown paper bags to color. The bags are a certain size and strength, so don’t use any old bag from home. There are some other rules about which side to color on, etc., so be sure to ask your local coordinator for their preferences. They tell me that the housebound seniors who get these bags often smooth them out and hang them up. Make sure you explain to your young Picassos who their drawings will be going to and how they will make the recipients very happy. Another specialty hospital near us is a residential one for adults with neurological disabilities. We participate in two events a year with this hospital. One we’ll be doing next week is the annual gift-wrapping program. Starting in December, this hospital reaches out to community groups to have children come in and wrap holiday gifts for their clients. We spend an hour wrapping gifts and then usually go out for a slice of pizza afterwards. I didn’t know if my kids were going to like doing this but for some reason they absolutely love it and they now bring friends along. Once again, I am sure to explain who is getting the gifts and why it is kind for us to help out. The other event we participate in at that hospital is actually coordinated by my parents (volunteering really is a family affair). This one is a Scarecrow Building contest. The public is invited to bring their own scarecrow clothes and accessories and my parents provide the stakes and hay. 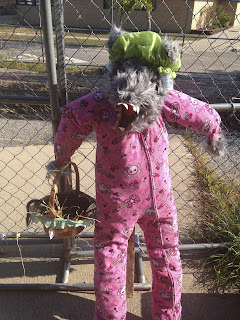 Everyone creates unique scarecrows that are then judged (everyone wins—scariest, funniest, most unique, etc.—a bag of candy for sharing). The grounds staff then places the scarecrows around the campus for the enjoyment of the patients, staff and visitors. If there’s not an opportunity like this near you, consider running it yourself. This project isn’t terribly hard to coordinate and like any other annual project, each year the coordinating becomes a little bit easier. Daddy O’s side of the family also is big on community service. One of his mother’s biggest volunteer commitments is as at the local Food Pantry. Whenever there is a food collection being held, I always check in with her on what their biggest needs are. It’s always a good idea to do this because there are many times they are overrun with certain items (boxed macaroni and cheese for example) and are sorely lacking the kinds of things most people don’t think of buying (instant coffee, toilet paper, etc.) Sometimes we keep a can in the kitchen for spare change and when it is full the kids take it to the money counting machine at the bank and then deliver it to Grandma so she can purchase exactly what they need. If you are in a position where you want to help but aren’t able to donate, why not just coordinate? Reach out to the groups that matter to you and find out what they need. Clean used jackets? New gloves? Food items? Holiday gifts? If you have kids in school, a drive can be set up through a few emails to school staff and a kid-decorated box dropped off at the lobby. We’re currently collecting gifts for local foster children. So far all I’ve done was email with the coordinator to find out what the biggest needs were, ask for donations on my personal Facebook page as well as on some of the local group pages I belong to and then set up a basket on my porch. This has taken me ten minutes or less. Later I’ll drive it all to the coordinators house and because of this minuscule effort, over 80 local foster kids will have a holiday full of gifts that can make them happy. I can’t give all of them a home but I can try to bring smiles to their faces. If none of these ideas can work for your family, try reaching out to service groups (Scouts, Church youth groups) in your area and find out what projects they are involved in. Make up your own ideas for daily/weekly good deeds*. Volunteering with kids shouldn't be something that stresses them or you, it should be fun. There are months we go without doing anything and then months when we’re involved in several projects. The important part is that we volunteer when we can and we always talk about who and why we are helping. Every single day I feel lucky. I can feel happy about that and do nothing or I can be verbal about my gratitude and give back to others as much as I can. I know the kids don't understand yet just how lucky we are but I hope by volunteering with them, they grow up to be compassionate and grateful adults--just like Daddy-O and I learned from volunteering with our own parents. *Our Good Deeds Advent Calendar. I LOVE this post - so informative and heartwarming! I am really happy to find out this types of sites.Its about the shoes item.Here i find out so many information about the so many types of shoes and also crossfit shoes.So its helpful for those people who are like to wear different types of shoes. Most kids are willing to volunteer when parents do, too. Lots of great ideas here. They're perfect to warm the hearts of other people especially this coming Christmas.